MTS, a file extension of high-definition AVCHD format, is now widely seen among a wide variety of digital video camera brands like Sony, Canon, Panasonic, JVC, etc. It works well in retaining the quality of high definition movies or wonderful video clips captured by the HD camcorders. However, it's awkward that you are unable to play these MTS files on your Windows Media Player or share them on YouTube. As a result, to convert MTS videos on Mac to AVI format comes across your mind as AVI is one of the most widely used format so far. Here we will catch a glimpse of the advantages to convert MTS to AVI format and then tell you how to do the MTS to AVI conversion on Mac computer, for example changing MTS to AVI on Macbook. Free Transcode AVCHD MTS to AVI Video Now! All-in-one video converter freeware for Mac users to free decode and encode AVCHD MTS to AVI video just a click away at GPU accelerated 5X faster speed (Intel/Nvidia/AMD) & no quality loss. 1. MTS is out of format supported lists of many popular devices and apps while AVI means an end to file format worries for mobile users. This is a key advantage to convert MTS to AVI format as AVI can be played on the majority of mobile devices and mainstream media players such as Windows Media Player. 2. It requires approximately 10 gigabytes per hour of video footage for MTS when recording HD video. But you can achieve higher rate compression after you decode MTS files to AVI format as the later only requires about 5 MB of storage space for each hour of video. To put it another way, this over-large MTS file can be shrunk to a much smaller AVI file without any quality loss. 3. AVI is famous for its excellent fidelity of the audio. 4. AVI can be used as a starting point to create playable DVDs. How to convert MTS video codec to AVI on macOS? 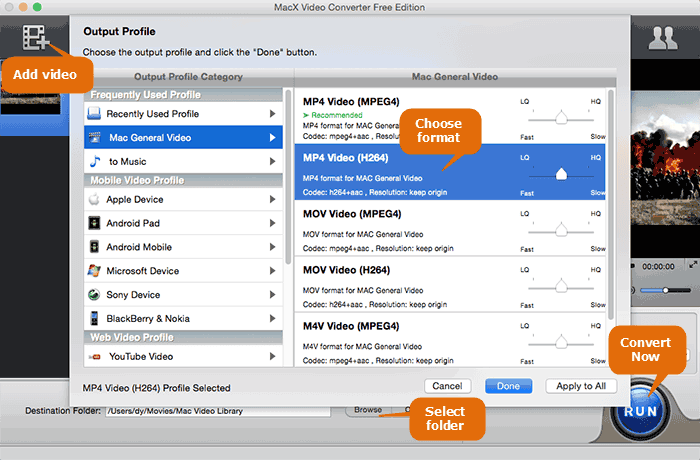 You need a video converter for Mac, and here I recommend MacX Video Converter Free to you. It lets you transcode AVCHD M2TS MTS to AVI, WMV, MOV, MPEG, or AVI to MP4, MKV to AVI, FLV to H.264, HEVC to H264, etc., and even extract audio from video to be saved as MP3 format at 5X faster than any other rivals (thanks to GPU HW acceleration techs). Free download this AVCHD MTS to AVI video converter on Mac first and then launch it on your MacBook iMac; import MTS source video by clicking "Add File" button. You can also add more than one video files and change them at one time. To convert MTS to AVI on Mac, you can choose AVI as the output format. By the way, this best free Mac AVI video converter also empowers you to decode MTS/M2TS to MOV, WMV, MPEG, etc at your disposal. Hit the "RUN" button to start encoding MTS to AVI on macOS. After a fraction of seconds, you can import MTS video to your AVI-compatible media player or upload to YouTube to share with your friends. One thing needs to be notified that its advanced version MacX Video Converter Pro works more efficiently for you to convert not only among SD MP4 FLV AVI MOV, WMV and HD video MTS M2TS AVCHD MKV on Mac but also download HD video from YouTube and transfer to the latest crop of mobile devices including iPhone X/8/7/Plus, iPad Pro, iPad Mini 4 Retina, HTC 10, Galaxy S8 , etc at 5x faster speed. Free download the free video processing software - MacX Video Converter Free to easily and fast transcode AVCHD MTS M2TS to AVI, MP4 with high quality reserved for limitelessly playbacvk on Windows Media Player, uploading to YouTube, Facebook etc.